Remove watermarks, date stamps and other unwanted objects on photos. Photo Stamp Remover 8.1 was available as a giveaway on April 27, 2016! 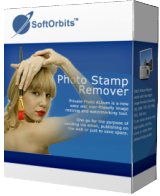 How would you improve Photo Stamp Remover 8.1? Allow direct entry of radius size. Error Message on Setup. Failed to Launch Program. Fix the drag and drop. It didn't work for me. First I must tell you that I tried it out the program to the depth before posting any comment. What looks so good at a first time when you import your series of pictures (in my case with a timestamp in it) turns out to be horrific frustrating the longer you try to work with it. 1. program is unstable !!! it crashed several times on my Windows 8.1. In mid of calculation. A NO GO ! 2. removal algorithms did not work as I want them to work, even on very similar pictures it produces different interpolations. 3. the calculating takes a very long time, even on small pictures (720x480) and even if the marked area is very very small. 4. when changing picture in batch-mode you lose the masking!!! Not worth the time I wasted with it. BatchInpaint from GOTD, though not the best content removal too, finally did the job for me more satisfying and stable. First I must tell you that I tried it out the program to the depth before posting any comment. What looks so good at a first time when you import your series of pictures (in my case with a timestamp in it) turns out to be horrific frustrating the longer you try to work with it. 1. program is unstable !!! it crashed several times on my Windows 8.1. In mid of calculation. A NO GO ! 2. removal algorithms did not work as I want them to work, even on very similar pictures it produces different interpolations. 3. the calculating takes a very long time, even on small pictures (720x480) and even if the marked area is very very small. 4. when changing picture in batch-mode you lose the masking!!! Sum up the disadvantages: UNSTABLE; SLOW, FULL OF ERRORS Not worth the time I wasted with it. Adding the fact that every new giveaway from Softorbits makes previous Softorbit giveaways unusable (reverts them back into demo-mode) I would say, keep your hands off this program in this stage of developement. It has more from a beta version than from commercial program. We are speaking of a paid program.... BatchInpaint from GOTD, though not the best content removal too, finally did the job for me more satisfying and stable. I just wanted to say thank you for this program. I had Inpaint on my XP computer and lost it when I had to get a new computer and I have been waiting for another similar program to remove unwanted objects. Thank you so much. The Inpaint version did look better so when this version of Photo stamp remover has it's activation revert I will just uninstall and not really miss it. I had this last time it was given away and found it reverted to less than a trial version next time I tried to use it. I will try it again though. I had this last time it was given away and found it reverted to less than a trial version next time I tried to use it. Uninstalled using Revo Uninstaller. I will try it again though. I just did a quick one, and I was startled that it cleaned up pretty well! Thanks SoftOrbits and GAOD!!! Re worries about removing watermarks and the person it "belongs to" . Its not always the case that the person owns it. I'm always running into art from old books (so no longer copyrights) and there is no way I'd ever find a copy of some book from the early 1900s etc,..(illustrations) they are just research for me, and treasured! I wouldn't clear up someones photos/drawings etc and use them! I think this is a great software to improve your photos, although you must be creative and flexible to get rid off your unwanted things from your photos. You must also have patience for that. But it does the job, and if you are not discouraged after three minutes of work you get a job well done. Hi, thought something wrong with my system - same issue as Homas below. Tried 3 times, unzipped, ran the .exe, said it's registered and activated, but no program installed. Searched - it's nowhere. Looked through 'Control Panel' "programs" - not listed. Win 10 system. ??? This happens if your anti-virus program is set to high and is blocking the install. You can turn down the settings or temporarily shut it off as you install. Remember to turn it back on before using the Net! GAOTD scans and checks every install, because if they gave out a virus even once their business would be dead. Right clicking on your anti-virus may give you an option for a 10 minute shutdown so if you forget it will auto-restart. It take a little time to shutdown your anti-virus so if you try right away it may fail, so try again and in works. I have to do this with a lot of GAOTD offers. DB, Thanks very much - that sorted out the install.. I should have thought of that- "senior moment"
Where is it located on my computer? I can't seem to locate it. I unzipped it, got my license key, etc. but can't locate the program! Thanks. "C:\Program Files (x86)\Photo Stamp Remover\StampRemover.exe"
homas, If you installed with default on win7/win10: "C:\Program Files (x86)\Photo Stamp Remover\StampRemover.exe"
No way! Instead I give a try with InPaint and it was very easy. Installed and tried to clean up the pic from the publisher's site: http://download.softorbits.com/softorbits.com/photo-stamp-remover/samples/IMG_01%281%29.jpg No way! Instead I give a try with InPaint and it was very easy. Uninstalled. @ Luis: this software wouldn't achieve anything like the results claimed for it on the developer's website. The shot of the buildings with figures 'cleaned' from the far right is especially hilarious: there are no contiguous blue pixels the software could've called upon to create the lower window sill in the same shade as the upper frame. As for the lady decorated every which way with logo over-printing: trust me, it's not a case of what takes hours to correct using the clone tool can be accomplished in a minute using Photo Stamp Remover more a case that using this software, it'd take you from here to Christmas and you'd still never manage it. This is being marketed as a 'photo stamp remover' and it may, just, manage that with small (5pt) type on a constant background. A 'photo stamp' more complicated than that, and it'll fail totally. As an 'object remover', it ought to fare better. That said though, time and again I've come across users of 'object removal' apps blaming what seems, to them, to be the software's failings when they themselves are at fault for not appreciating that unless you work at pixel level -- that is, with an image blown up to the absolute maximum and a 'brush' sized down to the absolute minimum then no. No software will work the way you hope it will. As for any professional / commercial photographer worried about intellectual property theft, aw, c'mon: if you (or your studio or your Art Department) doesn't even know how to protect your work from image manipulation then you perhaps shouldn't be in the business at all. Finally, a note of appreciation to SoftOrbits for the before-and-after pictures on its website. Brilliant, guys . . . though by my calendar, today is the 27th of April. Not the 1st. @ Luis: this software wouldn't achieve anything like the results claimed for it on the developer's website. The shot of the buildings with figures 'cleaned' from the far right is especially hilarious: there are no contiguous blue pixels the software could've called upon to create the lower window sill in the same shade as the upper frame. As for the lady decorated every which way with logo over-printing: trust me, it's not a case of <i>what takes hours to correct using the clone tool can be accomplished in a minute using Photo Stamp Remover </i>more a case that using this software, it'd take you from here to Christmas and you'd still never manage it. This is being marketed as a 'photo stamp remover' and it may, just, manage that with small (5pt) type on a constant background. A 'photo stamp' more complicated than that, and it'll fail totally. As an 'object remover', it ought to fare better. That said though, time and again I've come across users of 'object removal' apps blaming what seems, to them, to be the software's failings when they themselves are at fault for not appreciating that unless you work at pixel level -- that is, <b>with an image blown up to the absolute <i>maximum</i> and a 'brush' sized down to the absolute <i>minimum</i></b> then no. No software will work the way you hope it will. As for any professional / commercial photographer worried about intellectual property theft, aw, c'mon: if you (or your studio or your Art Department) doesn't even know how to protect your work from image manipulation then you perhaps shouldn't be in the business at all. Finally, a note of appreciation to SoftOrbits for the before-and-after pictures on its website. Brilliant, guys . . . though by my calendar, today is the 27th of April. Not the 1st. I did only her face and chest, because I didn't feel like going from April to Christmas, but I did it honestly and carefully. Radius size: 10. That being said, Photo Stamp Remover can sometimes do the job, and its edge over InPaint is that it supports transparency, but such forgeries discredit SoftOrbits. MikeR, how about some fact checking, and the REAL before-and-after on that "lady decorated every which way with logo over-printing": http://ahp.li/d9b18ed90e3c8d6e9556.jpg (My web host is perfectly safe, whatever sur-ly might say) I did only her face and chest, because I didn't feel like going from April to Christmas, but I did it honestly and carefully. Radius size: 10. That being said, Photo Stamp Remover can sometimes do the job, and its edge over InPaint is that it supports transparency, but such forgeries discredit SoftOrbits. What this software do is to take away the foreground and put the background there instead, that means that if you have a picture with, say a tree in the background, a face with a text and want to take away the text it will take away the text and put some parts of the tree (background) where the text was, and that will, in this case be where it is supposed to be a face. Put in other words, if the software should be able to do its work it need a very clean background, a very clean foreground and nothing else. Software downloaded, tested and deleted as useless. "... to take away the text it will take away the text and put some parts of the tree (background) where the text was... Put in other words, if the software should be able to do its work it need a very clean background, a very clean foreground and nothing else." It can be difficult to remove so-called watermarks -- that's the whole reason they're added to an image, to prevent you from re-using an image or video without acknowledging the source. And because you don't want to remove what's underneath the watermark, that rules out apps like the popular Inpaint. About all you can do is take data from surrounding pixels & paint over the watermark, in this case text. That can be tedious, so apps like Photo Stamp Remover try to automate it, with varying degrees of success, depending on the app, the image, & the watermark. I'd expect Photo Stamp Remover would do better with something like the date stamp on a photo, since that's usually out of the way of the photo's main object or subject, & it's not designed to be hard to remove [where watermarks can be]. If removing watermarks or date stamps or whatever is something you do, or might do, it doesn't hurt in the least to keep something like Photo Stamp Remover handy -- it might work, and if it doesn't, you're certainly no worse off for trying. You *might* even keep a few similar apps, & try every one to see what does best on a particular image. If nothing works well enough you'll just have to do it manually in your preferred image editor -- there just is no magic bullet for image &/or video watermark or logo removal that will work 1st time, every time. par, <i>"... to take away the text it will take away the text and put some parts of the tree (background) where the text was... Put in other words, if the software should be able to do its work it need a very clean background, a very clean foreground and nothing else. "</i> It can be difficult to remove so-called watermarks -- that's the whole reason they're added to an image, to prevent you from re-using an image or video without acknowledging the source. And because you don't want to remove what's underneath the watermark, that rules out apps like the popular Inpaint. About all you can do is take data from surrounding pixels & paint over the watermark, in this case text. That can be tedious, so apps like Photo Stamp Remover try to automate it, with varying degrees of success, depending on the app, the image, & the watermark. I'd expect Photo Stamp Remover would do better with something like the date stamp on a photo, since that's usually out of the way of the photo's main object or subject, & it's not designed to be hard to remove [where watermarks can be]. If removing watermarks or date stamps or whatever is something you do, or might do, it doesn't hurt in the least to keep something like Photo Stamp Remover handy -- it might work, and if it doesn't, you're certainly no worse off for trying. You *might* even keep a few similar apps, & try every one to see what does best on a particular image. If nothing works well enough you'll just have to do it manually in your preferred image editor -- there just is no magic bullet for image &/or video watermark or logo removal that will work 1st time, every time. mike, it's also a crime. If I catch someone re-using my work without permission I will sue them, and possibly have them arrested. Although copyright violation CAN be criminal, it is almost always treated as a civil offense since the standard for criminal conviction is extremely high. That being said, the civil penalties are sufficiently large that it should dissuade people from engaging in it. Please note, however, that removal of watermarks itself does not constitute a criminal action since there are legitimate reasons to do so as well. To give one example, once your copyright expires (admittedly in a very lengthy time), watermark removal would be 100% legal. To give another example, the removal of watermarks on your OWN work (for example if you lost your original and only have the watermarked copy) is 100% legal. For example, I sometimes use a watermark removal tool when I forget to turn off the date stamp on my own photos and my camera has automatically inserted them. Matthew, Although copyright violation CAN be criminal, it is almost always treated as a civil offense since the standard for criminal conviction is extremely high. That being said, the civil penalties are sufficiently large that it should dissuade people from engaging in it. Please note, however, that removal of watermarks itself does not constitute a criminal action since there are legitimate reasons to do so as well. To give one example, once your copyright expires (admittedly in a very lengthy time), watermark removal would be 100% legal. To give another example, the removal of watermarks on your OWN work (for example if you lost your original and only have the watermarked copy) is 100% legal. For example, I sometimes use a watermark removal tool when I forget to turn off the date stamp on my own photos and my camera has automatically inserted them. Carolyn Wu, How many people on GOTD are professional photographers who need a free program to remove a watermark? And, just to say it, the copyright remains on the image for 95 years, or in some cases 70 years after the death of the artist. So if you are getting your free software to remove a watermark and use an image, then know that you can be sued. The statutory award for each violation of Section 1202 ranges from $2,500 to $25,000. The DMCA is another important tool in the photographer’s legal toolkit." We work HARD for our images. I for one do not want my work STOLEN, MODIFIED, or ALTERED without my permission. That is why I have model releases, property releases, and try to stay within the limits of the law. I've got photographs in a number of major publications, and can tell you that getting those images is not easy... it takes study, time, effort, the cost of models, the cost of fuel, equipment, and most important, TIME. Taking an image that does not belong to you is stealing. Carolyn Wu, How many people on GOTD are professional photographers who need a free program to remove a watermark? And, just to say it, the copyright remains on the image for 95 years, or in some cases 70 years after the death of the artist. So if you are getting your free software to remove a watermark and use an image, then know that you can be sued. This is from Carolyn E. Wright of the Law Office of Carolyn E. Wright, LLC. "The DMCA also provides for certain damages when your work is infringed. If the infringer has removed your copyright management information, such as your name, contact information, or copyright notice, from your work in an attempt to facilitate or conceal its infringement, the infringer may have violated the DMCA. Section 1202(b) of the DMCA prohibits the removal of “copyright management information” in certain circumstances. It states in pertinent part: No person shall, without the authority of the copyright owner or the law—(1) intentionally remove or alter any copyright management information . . . . knowing, or, with respect to civil remedies . . . having reasonable grounds to know, that it will induce, enable, facilitate, or conceal an infringement of any right under this title. The statutory award for each violation of Section 1202 ranges from $2,500 to $25,000. The DMCA is another important tool in the photographer’s legal toolkit." We work HARD for our images. I for one do not want my work STOLEN, MODIFIED, or ALTERED without my permission. That is why I have model releases, property releases, and try to stay within the limits of the law. I've got photographs in a number of major publications, and can tell you that getting those images is not easy... it takes study, time, effort, the cost of models, the cost of fuel, equipment, and most important, TIME. Taking an image that does not belong to you is stealing. can this remove moustache on people ? Apu, right after a razor, I would rather suggest InPaint for that purpose. Because in InPaint you can choose precisely with what part of your face you want to replace your moustache, while you can't in PSR, which will replace it with what is finds around it, i.e. little bits of your nostrils, lips, even spectacles, and I don't even want to think of the result. But I am sure you are very handsome with your moustache. Apu, I forgot to add that you could try to remove that bluedanubesque moustache of yours with the clone stamp in PSD, but I can't make it work, I would be interested to know if it is just me... and I sure am the handsomest female in Paris... even without a moustache. Inpaint by Teorex, which is periodically given away here is the benchmark in this category. I've been using it for years. It does NOT expire and only keeps getting better with each version. The list price only is $19.99 not $49.99. "Inpaint by Teorex, which is periodically given away here is the benchmark in this category. " Actually I believe that's a bit of an apples & oranges sort of comparison... Inpaint & similar can work well when you're removing an entire object, whereas a logo or watermark may be imprinted across the main subject of an image or video, often effecting areas with enough detail that a quick bit of inpainting would obscure. That said, if you go through the work of creating a mask [or masks] selection in an image editing app, you could try inpainting, or cloning, or painting, or maybe even all 3 to see what got the best results. Gary, <i>"Inpaint by Teorex, which is periodically given away here is the benchmark in this category. "</i> Actually I believe that's a bit of an apples & oranges sort of comparison... Inpaint & similar can work well when you're removing an entire object, whereas a logo or watermark may be imprinted across the main subject of an image or video, often effecting areas with enough detail that a quick bit of inpainting would obscure. That said, if you go through the work of creating a mask [or masks] selection in an image editing app, you could try inpainting, or cloning, or painting, or maybe even all 3 to see what got the best results. mike, I zoom in really tight and remove a logo in pieces. It works really well. Choosing the donor area is critical. I use the erase donor object more than any other object. To those who are wondering if this program will install and run on an old XP SP3 system, yes! I made myself the "guinea pig" and tried it- installed and runs fine. 1. I tried to unsubscribe using the "unsubscribe" link in the registration email; it does not work (I got a error of "Oops! the page you are looking for could not be found.") so maybe the moral of the story here is use a disposable email for this one! All my other SoftOrbits programs have now de-registered, I thought they had fixed this problem, obviously not. Joe, I suggest you click the link on my post below. So I see that I'm not alone with the deactivation of the program. Photo Stamp Remover will still remove the undesirable object but will not save it. My workaround is to use Photo Stamp Remover first followed by Windows Snipping Tool to save the cleaned up picture. I realize that this is not practicle for most but it works for me. I had to try this out, I use a three letter monogram as a 'watermark' that's pretty big when sending images to clients, it stops people from keeping them instead of purchasing the actual image. OK to be fair its a large and complicated watermark...so I didn't REALLY expect it to work. I tried using this to remove that watermark...it totally failed and made a mess of the image. And I'm glad of it...it means that the method I use works ( so far )! Ian Campbell-Harris, People don't understand that a photographer may spend four or five thousand dollars to get some of the images they jsut take for granted. Equpment and constant upgrades, cameras, heck some of the CMOS's cost int he 20-30,000.00 range and that is money that we need BACK from the sale of the pictures. I need the income to keep doing what I do. So when I see a giveaway that basically threatens my livelihood, I'm NOT amused. Ian Campbell-Harris, People don't understand that a photographer may spend four or five thousand dollars to get some of the images they jsut take for granted. Equpment and constant upgrades, cameras, heck some of the CMOS's cost int he 20-30,000.00 range and that is money that we need BACK from the sale of the pictures. I need the income to keep doing what I do. So when I see a giveaway that basically threatens my livelihood, I'm NOT amused. Matthew, I agree...100%. I'm ( mostly ) retired now...I just do the occasional job, if it suits ME to do it. But I've had people complain ( loudly and bitterly ) the the proofs I sent them had a watermark on them...and they couldn't print them because of that...really? and there was I thinking that was the whole idea! If you don't take precautions what would happen is you end up not just working for nothing, but subsidising somebody wedding ( or whatever ). Ian Campbell-Harris, Had the same thing happen. "I took the proofs to Walmar to get htem printed, and they refused! What did you do!" "You have to buy the pictures." "You spent, what, ten minutes and want me to pay you a hundred dollars????" Ian Campbell-Harris, Had the same thing happen. "I took the proofs to Walmar to get htem printed, and they refused! What did you do!" "You have to buy the pictures." "You spent, what, ten minutes and want me to pay you a hundred dollars????" @ ouialaraison: Kudos to you for being kind enough to draw that forum thread to the attention of others here (and for initiating that thread, too.) Kudos, too, to GOTD for facilitating that forum / forum thread and for featuring your post here. ouialaraison, Indeed ;-) Let's hope these products now "stick" -- time will tell . . . Seems like the proverbial "irresistible force meeting an immovable object" doesn't it? Who wins? But in this case, there is a third way, which is what I, as a professional photographer would want to use it for -- not removing someone ELSE's watermarks (or even my own), but for getting rid of that equally proverbial "tree growing out of someone's head", or someone's arm encroaching into a shot, that would otherwise be "perfect". I must admit, as a magazine photographer, I wish I had known, years ago, that these sorts of programmes were coming.... So many otherwise great shots I simply didn't shoot -- because they were ruined by something ELSE in the shot that I didn't want. True, it took digital photography to get to them (other than hand-painting, which is usually out of the question), and true also that I would have had to SAVE the photos (mostly colour slides) for years before I could go back and "fix" them.... But the point is, generally I never even shot them. This programme, and others like it, has really made digital photography worthwhile. Not that I am a recent convert of course -- after resisting it for some years, I embraced it about 8-9 years ago. Nowadays I use "digital enhancement" as a matter of course. And this programme is one of the most useful. Get it now -- even if you only begin to find its uses later. @ Bob... Seems like the proverbial "irresistible force meeting an immovable object" doesn't it? Who wins? But in this case, there is a third way, which is what I, as a professional photographer would want to use it for -- not removing someone ELSE's watermarks (or even my own), but for getting rid of that equally proverbial "tree growing out of someone's head", or someone's arm encroaching into a shot, that would otherwise be "perfect". I must admit, as a magazine photographer, I wish I had known, years ago, that these sorts of programmes were coming.... So many otherwise great shots I simply didn't shoot -- because they were ruined by something ELSE in the shot that I didn't want. True, it took digital photography to get to them (other than hand-painting, which is usually out of the question), and true also that I would have had to SAVE the photos (mostly colour slides) for years before I could go back and "fix" them.... But the point is, generally I never even shot them. This programme, and others like it, has really made digital photography worthwhile. Not that I am a recent convert of course -- after resisting it for some years, I embraced it about 8-9 years ago. Nowadays I use "digital enhancement" as a matter of course. And this programme is one of the most useful. Get it now -- even if you only begin to find its uses later. Movavi has featured on GOTD in the past (which was how I discovered it) but nowadays seems -- deservedly -- to have developed so substantial a customer base that its giveaways are rare. Photo Editor works superbly well, the Movavi algorithms noticeably superior to those in other software products (and especially, the removal of unwanted objects from images.) Nothing I've seen from any developer (and in my line of work, we've tried 'em all) has equalled Movavi's performance or deceptively simple ease-of-use. Cheap enough to purchase outright by anyone with a love of picture-taking -- we're not talking Adobe-style stratospheric costs here -- I'd commend Movavi to you in your life as a professional photographer. . . as well as commend it to everyone who isn't. As to today's offer, it's definitely worth trying in the same way that so many others (like inPaint, for example) are worth investigating. But don't try / don't investigate in isolation: software like this needs a price and quality benchmark -- and that benchmark is Movavi Photo Editor, which should be trial-downloaded, too. @ Tranmontane: As a professional photographer, you're doing yourself few favors by restricting yourself to one-horse software like this. In our studios, we use Adobe CS and a ton of other high-end stuff . . . but for a quick yet comprehensive make-over (when there's a rush to draft visuals for a mis-scheduled client presentation) then the go-to, amazingly enough, is this: http://www.movavi.com/picture-editor/ Movavi has featured on GOTD in the past (which was how I discovered it) but nowadays seems -- deservedly -- to have developed so substantial a customer base that its giveaways are rare. Photo Editor works superbly well, the Movavi algorithms noticeably superior to those in other software products (and especially, the removal of unwanted objects from images.) Nothing I've seen from <i>any</i> developer (and in my line of work, we've tried 'em all) has equalled Movavi's performance or deceptively simple ease-of-use. Cheap enough to purchase outright by anyone with a love of picture-taking -- we're not talking Adobe-style stratospheric costs here -- I'd commend Movavi to you in your life as a professional photographer. . . as well as commend it to everyone who isn't. As to today's offer, it's definitely worth trying in the same way that so many others (like inPaint, for example) are worth investigating. But don't try / don't investigate in isolation: software like this needs a price and quality benchmark -- and that benchmark is Movavi Photo Editor, which should be trial-downloaded, too. I downloaded twice! Extracted files & it's nowhere to be seen. Isn't a shortcut or icon placed on your desktop? Allan , why did you add a ;) at the end of your comment? Where you joking about your entire answer or just part of it? Which part were you just joking about? I'm all confused now! Swamp Thing, Hi, it's just a friendly smiley, and of course, I don't joke, when I try to help a fellow user out. However, I quit the comment section in future, as long as the "entitled to" segment is ruling in here. I'm sure, the voting system is fixed somehow to be still more negative and unfriendly. Thanks to the team behind GAOTD anyway - and, SoftOrbits for the generous offer. Swamp Thing, Hi, it's just a friendly smiley, and of course, I don't joke, when I try to help a fellow user out. However, I quit the comment section in future, as long as the "entitled to" segment is ruling in here. I'm sure, the voting system is fixed somehow to be still more negative and unfriendly. Thanks to the team behind GAOTD anyway - and, SoftOrbits for the generous offer. "By using the program, digital photos can be effectively protected from unauthorized use. This photo watermark software places permanent watermarks that cannot be removed." ...So, one adds watermarks that cannot be removed and this one removes watermarks. Installed on Win 10 X64. no problems,works perfectly. registration was simple and fast! Installed on Win 10 X64. no problems,works perfectly. registration was simple and fast! But it will not last. I also find all SoftOrbits programs have de-registered themselves on my computers. Please read the third comment, where I found out that I am not the only one this is happening to. Myk Kelly, But it will not last. I also find all SoftOrbits programs have de-registered themselves on my computers. Please read the third comment, where I found out that I am not the only one this is happening to.